This algae preventative is a long lasting additive for water features and decorative fountains which are mounted outdoors, helping to keep the water clean and clear. The Algae Stopper water treatment helps to eliminate both green algae and bacteria which can breed rapidly if the water is exposed to sunlight for prolonged periods. If you have pets or wildlife, the algae stopper is safe for birds and animals when used as per the instructions supplied. Algae Stopper is supplied in a 385g container. Provides water feature care for our EasyFountain and Henri Studio range of products, but can also be used with any outdoor water feature or cascade (not suitable for ponds with fish). Algae Stopper Tub - 385g volume. For best results, clean and fill your fountain with fresh water then add one (10ml) measuring cap for every 5 litres of water whilst the fountain is running. 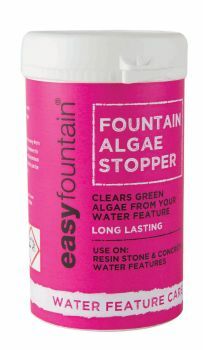 Add more algae stopper every month to maintain control.